I have one of these, they were advertised here in early 1930's. They had a socket on back for testing continuity of radio valve filaments. I also have a German version called a 'Universalprufer' in a nickelled brass case. The multi sided Bakelite case on the English version looks like it could have been base for a trophy cup. In the early 1970s I was working as a TV engineer in south Cheshire and part of my area was the small Shropshire town of Market Drayton. 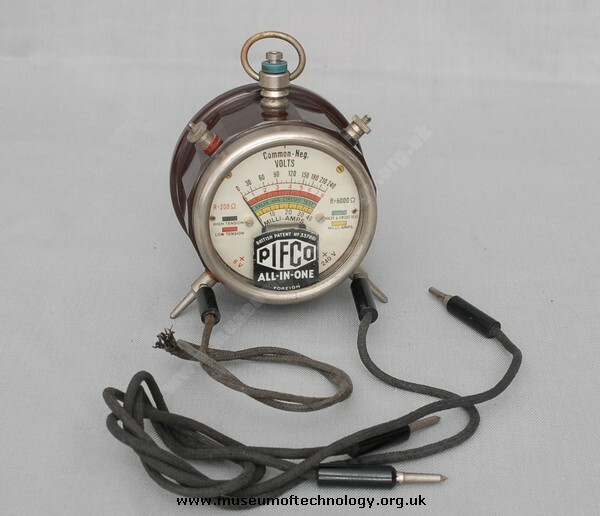 I was given one of these Multimeter's by a lady who was related to one of its inventors a Mr Joseph Cooper. Inside the casing was a single cell battery going by the name of �STESCO BRITISH MADE� a name I have never herd of. The meter now sits on a shelf in my study and it has always intrigued me because of the patent date being 1930 but the meter is rather colourful for a 1930s item. Also I feel that the meter may have been manufactured in Germany because of its basic high quality but that is only my personal feeling. And finally PIFCO is the initials of the �Provincial Incandescent Fittings Company� this was on a piece of paper in the box with the meter when I was first given it. I remember being given one of these by a kind teacher at school in the late 70s. I expect he wanted to encourage my interest in electricity and the sciences. I may still have it somewhere and I'm shocked to read that it was so old. I thought these were made in the 50's or 60s rather than the 20s. I remember it had an HP7 battery inside for resistance measurement and was only about 10% accurate maybe down to the decaying Bakelite body as much as the crude movement.